The simple art of origami may be regarded as pure personal enjoyment, but some may say there are deeper meanings to the art. Since the paper rose signifies everlasting beauty, it can be given to a significant other to impress them or win them over. The following instructions are for an origami rose designed by Toshikazu Kawasaki. Obtain some colorful, square paper (see "Things You'll Need"). Face the colorful side of the paper up towards you. Fold the square in half so that the decorated side of the paper is folded inside. Open up the paper, turn it over, and draw a black line along the crease of the back side. (The colorful side will be the color of your rose, and that is why lines are drawn on the back (plain) side, so that they will not be seen). Fold the lower and upper half in half again, so that the square is equally divided into four parts. Color these creases. Rotate the paper and repeat the last two steps, so that now you have 16 little squares. Fold the paper diagonally both ways. You should have two lines dividing the paper diagonally, giving you four triangles. This is shown with red lines. Fold the lower half up one third. Open up the paper and rotate it 90 degrees. Repeat the last two steps. This is shown with green lines. With each corner, fold black and red lines upwards (valley folds) and green lines inwards (mountain folds). Press down on the horizontal and vertical parts counter-clockwise gently, leaving the middle standing out. Press down on the four corners of the center part and it should turn into a tiny flat square. Turn the paper around so that the colorful side faces up. Use labels. To make it easier to understand, label the four parts, then lift up the fourth (lower right) square and rotate it 90 degrees, counterclockwise, to the left vertical border of square two. Make sure the two borders align exactly. Rotate around to each square and repeat the last two steps with all four squares. Round up all four sides, and now you have the basic shape of the rose in your hand. Flip the rose upside down. Now you are looking into the inside of the rose. Fold down the petals one by one. Once you reach the last petal, tuck it under the gap beneath the previous petal. Turn it over. Now you have a pretty rose. You can add a stem for it, using wire and a few pieces of leaves with green paper. Now you are done! To make it look more realistic, use a thin round pen as a curling tool to curl up the four petals. alternatively you could use a chopstick or if you have one you could use a knitting needle for a tighter curl. You can use any square piece of paper to fold this rose, although it will be easier if you use one that you can distinguish the front and back side of the paper clearly. The type of paper used in this demonstration has two sides. The colorful side is the front side of the paper. The side with only one color is the back side of the paper. Article provided by wikiHow, a collaborative writing project to build the world's largest, highest quality how-to manual. 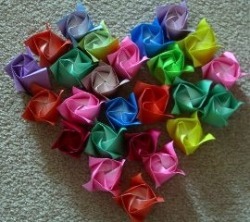 Please edit this article and find author credits at the original wikiHow article on How to Fold a Paper Rose. All content on wikiHow can be shared under a Creative Commons license.